Psychological injuries are covered under workers' compensation, but it is also difficult to prove. Emotional distress and psychological injuries are covered by the D.C. Workers' Compensation Act, but in practice are difficult to prove unless there was a physical injury, such as an assault, or the employee witnessed a horrific event on the job-- such as a train operator witnessing a suicide when a passenger deliberately jumps off the platform in front of the train. Basically, the worker must show the actual working conditions could have caused similar emotional injury in a worker who was not predisposed to such an injury. For example, harsh or negative treatment by supervisor rarely rises to this level. Again, though, the law is different in different states. While it may be difficult to prove a claim like this in D.C., it may be easier to do so in another state. 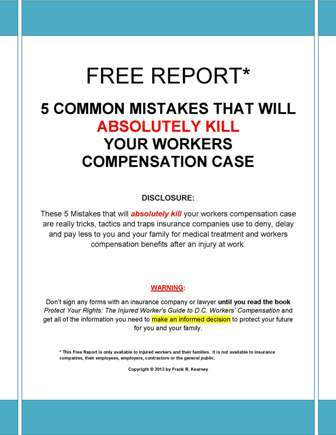 To learn more about workers' compensation claims and benefits, call or email to request a copy of our book Protect Your Rights: The Ultimate Guide to D.C. Workers' Compensation. Or just call us at 202-393-3320.